Construction continues at Bedford Marketplace. Above is the new building going up that faces Great Road. 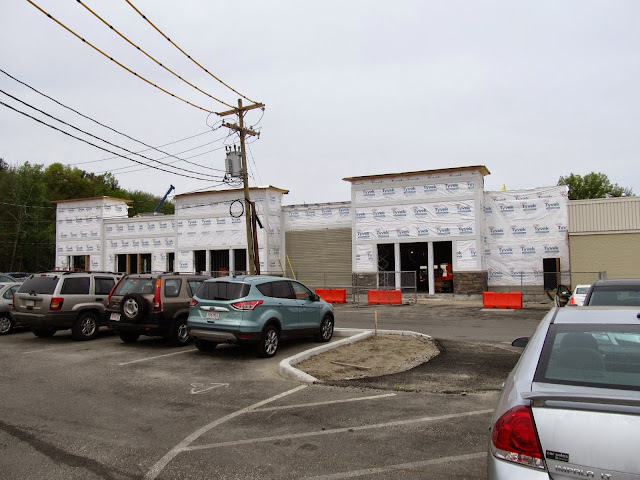 The left front of the building is expected to house a Bank with a drive thru in the rear. Once this building has been completed and tenants have moved in, the old building that housed Cafe Luigi's, Bank of America and other tenants will be demolished. 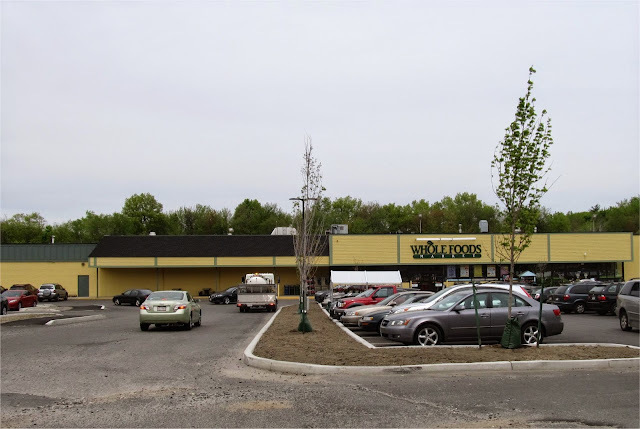 New trees have been added to the shopping center. The Green Bags around the base of the trees are known as Treegators. They are filled with about 15 gallons of water which is slowly released over a period of about a week. The bags are then refilled. A new front entranceway has been proposed for Whole Foods. 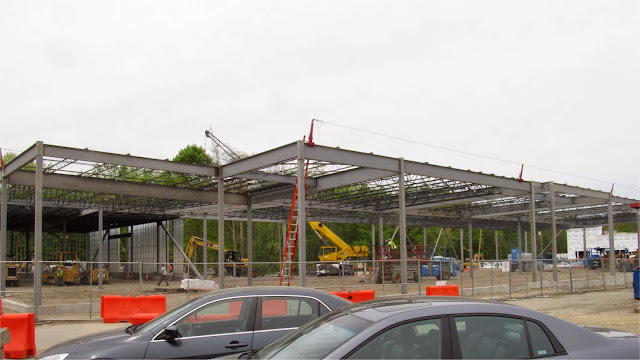 The new addition which would stand in front of the existing storefront, has a maximum height of 45 feet. The new 17,000 square foot building to the left of Marshall's. The section to the left of the telephone pole will be Red Heat Tavern which is expected to open this fall. The right section which is just under 12,000 square feet, appears to still be under negotiation with a prospective tenant (unconfirmed reports have indicated this may be a pet store). While the new buildings are all one story, they are much higher than the existing buildings. 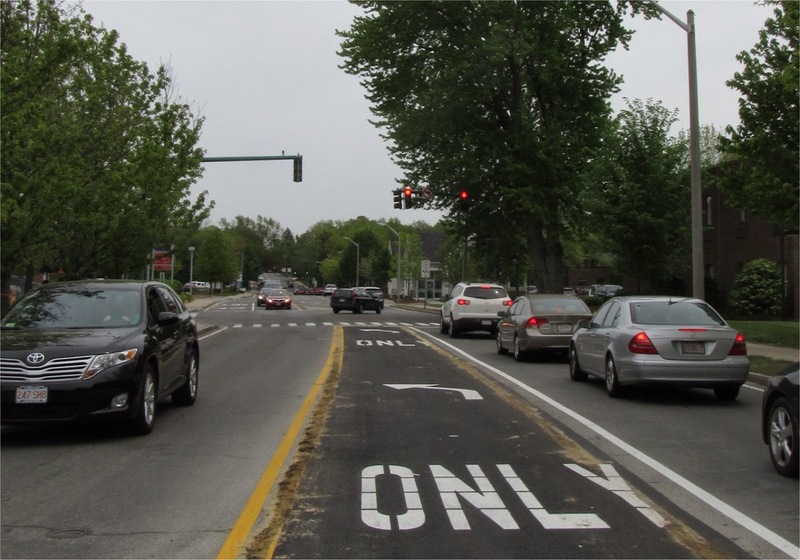 As part of the renovation to help improve traffic flow, a left turn lane was just added (view is heading east on Great Road). The traffic signal still needs to be updated along with the no left turn sign on the traffic pole. 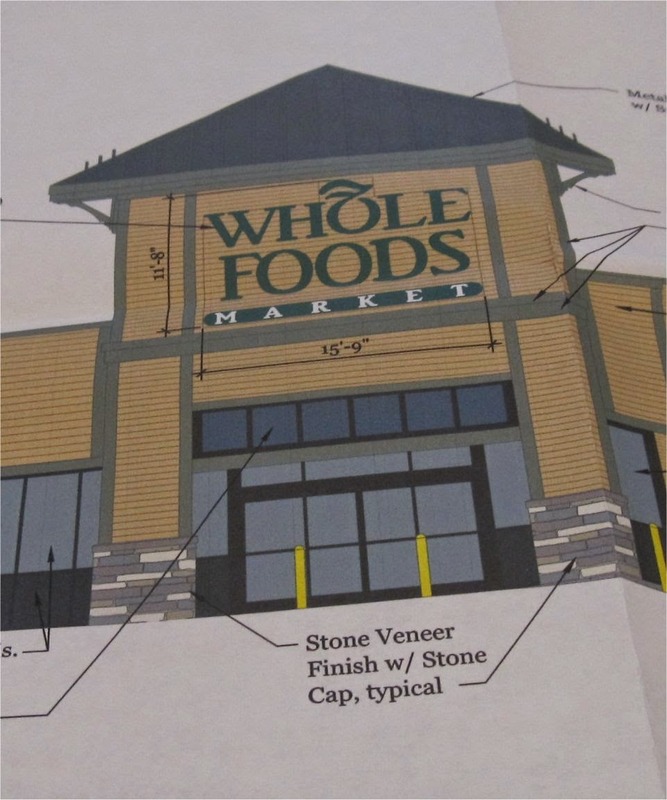 Above is a general overview of how the shopping center will look once renovations have been completed. 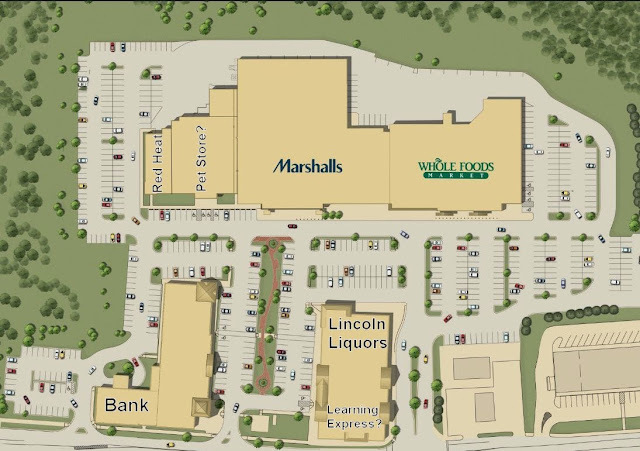 The center building that currently houses Lincoln Liquors will be rebuilt closer to Great Road with the Liquor store being moved to the back of the building. In addition, a Learning Express Toys store has been proposed for the front of the building and is currently up for review by the zoning board of appeals. 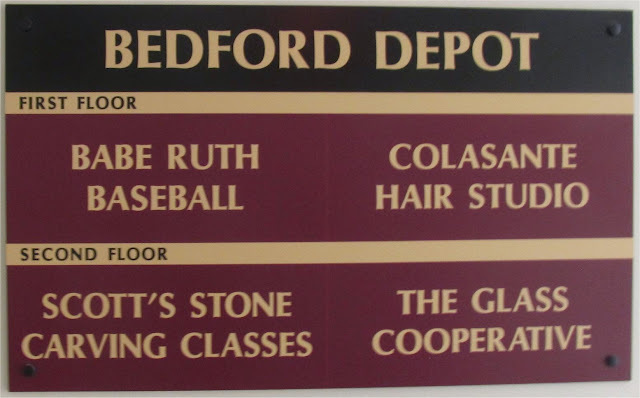 Colasante Hair Studio recently moved from the Bedford Marketplace to the Bedford Depot Building at 80 Loomis Street. 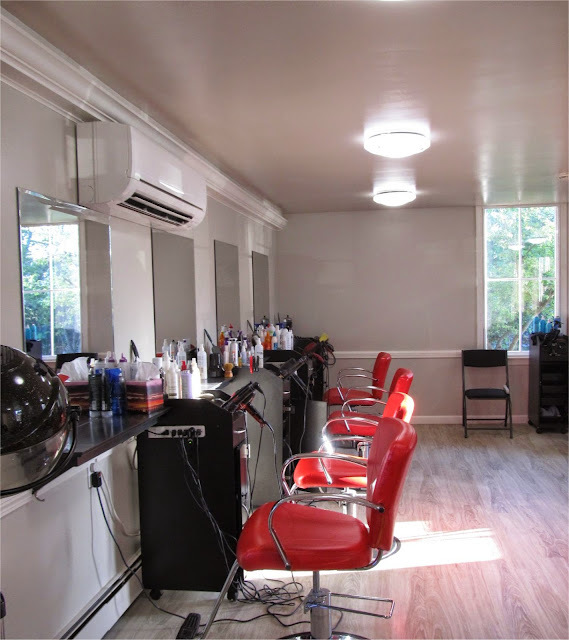 The shop which opened in November 2013, replaced the Center Hair Stylist barbershop. The Studio also sells a wide assortment of retail hair products. 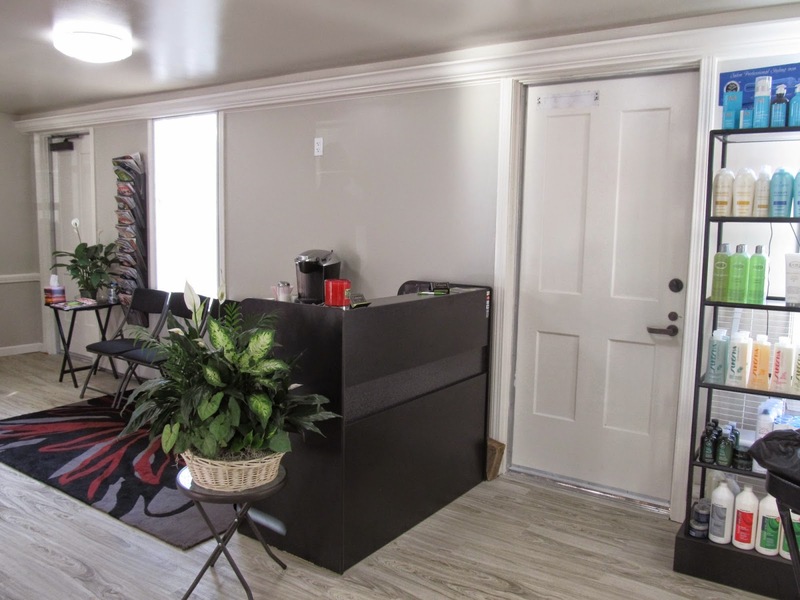 The space, which was just renovated was formerly occupied by JRM Antiques. As previously reported, the Studio's expertise is in hair coloring. The stylists makes frequent use of hair color products with protein and extra virgin olive oil to condition the hair and keep the color shiny. 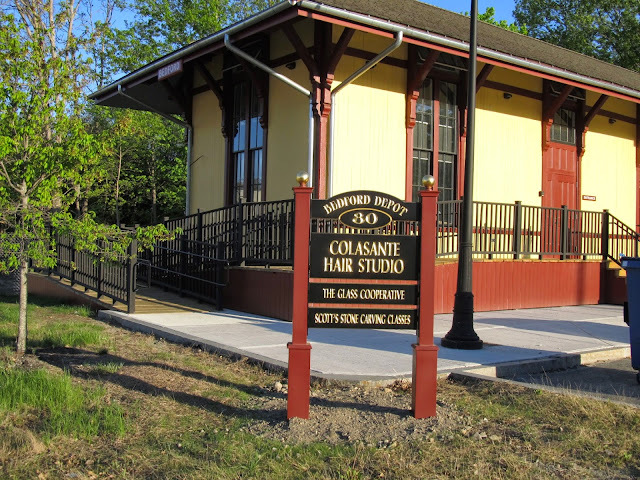 The Bedford Depot Building which was formerly used as a railroad station, underwent an exterior renovation in 2014 that included new doors and windows along with a handicap-accessible restroom. The Bedford Depot building is now fully leased out. It's good to see retail back in the Depot Building. 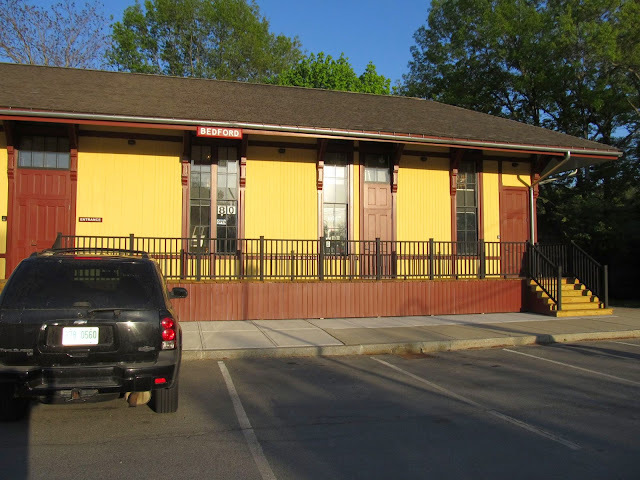 Along with the renovations (which have improved the look and feel of the Depot District), there have also been improvements with signage but some additional improvements may still be needed to draw retail traffic. The Depot District will soon be getting additional retail space with the completion of The Crossing at Bedford (54 Loomis Street) this summer which includes 2800 square feet and the expansion of the Bikeway Source building adds another 1250 square feet. How the Depot Building looked in 2008 before a series of renovations.